First Place - Three in a Row! For the third year in a row, the Connecticut Master Chorale took first place in the annual McDonald’s Gospelfest competition held Sunday evening at the Palace Theater in Stamford. "We never expected to win two years ago when we first entered the contest, and now to win three consecutive years is simply incredible!" said the Chorale’s founder and director, Tina Johns Heidrich. The group competed with a rousing piece called " Goin’ to Bethlehem" by Jay Althouse which they performed in their Holiday Prelude Concert last November. The Chorale performed this same number last December when they accepted an invitation to sing at the White House. It is a propelling a cappella spiritual-style number with energizing rhythmic figures - first establishing a catchy theme and then adding exciting syncopations, variations and harmonies with intensity rising and falling until the climactic final chord. The Chorale can be heard singing "Goin' to Bethlehem" here. "When I heard the audience singing along with us and cheering and clapping with enthusiasm, it was exhilarating!" said Nancy Lavers of Danbury who sings alto. "They have come to love us!" "When we started the group four years ago there were a lot of details to consider, but I never thought we’d need a trophy shelf!" Heidrich said, smiling. The group now has earned three huge trophies plus another nice check to help cover their operating costs. "We’re a versatile group," said Heidrich. "We spent the last two months working on Handel and quickly switched to Gospel for the event." Just one week ago the Master Chorale performed Handel’s epic oratorio " Judas Maccabaeus" in one of their three major concerts held locally each season. Gospelfest, sponsored and operated by the McDonald’s Corporation and McDonald’s Tri-State Owners’ Association, has grown in popularity over the years since the first one held in 1984. " Back then only 114 groups auditioned for the competition," explained A. Curtis Farrow, producer and director of Gospelfest 2003. " This year, about 50,000 groups and individuals auditioned in various categories: adult choirs, youth choirs, soloists, praise dancers, poets and rappers". The Master Chorale competed in the Adult Choir category. "Each year I know that the Connecticut Master Chorale will come to the table with something new, fresh and exciting," continued Farrow. " But this year was beyond my wildest expectations. They were Fantabulous!!" "The most impressive thing to me about the Gospelfest is the fellowship and camaraderie of everyone there," said Heidrich. " The house is filled with friendliness and warmth and it’s a true privilege to sing for such an appreciative audience." "It is as if we are family with all the people who remembered and welcomed us," said Ray Oksala of New Fairfield, who sings tenor. In addition to the competition, the production featured notable gospel stars Cissy Houston, Vickie Wynans, Natalie Wilson and the Sounds of Praise Chorale, and Hezekiah Walker and the Love Fellowship Tabernacle Choir. The event also included the McDonald’s New York Metro Gospel Choir. 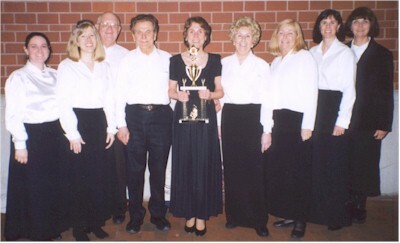 The Connecticut Master Chorale, just completing its fourth season has achieved several accomplishments in its short history. In addition to receiving the high honor of singing at the White House, the Chorale has also performed by invitation at Carnegie Hall twice and at West Point Military Academy. The next performance of the Connecticut Master Chorale will be their Holiday Prelude Concert in November in Bethel. See our 2001 Gospelfest performance and interview televised by ABC7.